The quantity of mercury in the ocean and in our fish has become scary and a cause of angst among many health conscious eaters, and so farm-raised fish are being more frequently chosen over those which are caught from the wild. We often get asked: What is the healthier choice? Wild-Caught or Farm-Raised? Nutritionally speaking, the FDA data reveals that there are in fact nutritional differences between farm-raised and wild-caught salmon. In particular, wild salmon have a lower fat content (at about 20% by weight) and a higher protein content (at about 20% by weight) than compared to farm-raised salmon which come in at a whopping 30-35% fat content by weight! Additionally, the amount of omega-6 fats are proportionally high in farm-raised salmon whereas their omega-3 is low compared to Wild-caught salmon. When this occurs the omega-6's use up specific enzymes contributing to a pro-inflammatory state. 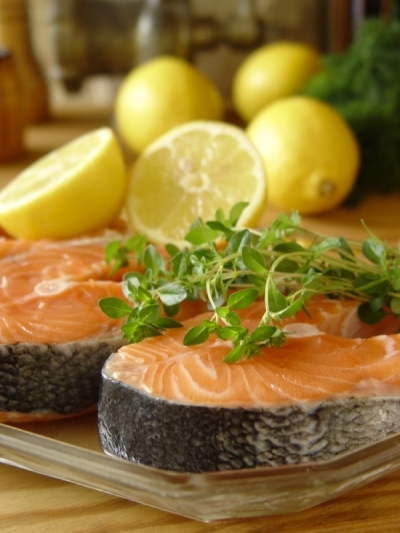 While we need both omega-3 and omega-6 in our diet, omega-3 is much harder to obtain from our regular diets and we usually do so by eating cold water fish such as salmon. While on the other hand it is easy for us to get omega-6 as they are relatively abundant in our diet. Unfortunately the salmon that are raised in farms do not swim a lot, especially through chilly seas or struggling to swim upstream. They do not swim much in their small and often crowded enclosures, they are restricted in their movements, and are fed fish food which came easily to them, and they didn't have to search or fight for it. As a result, without the right amount of exercise and food, the fat content of their body grew. Farm raised Coho salmon have been noted to have nearly triple the amount of fat of a wild salmon. There are many kinds of infections and parasites such as fish lice that can affect a farmed salmon especially if it's enclosure is densely packed. To avoid this, farmed fish are vaccinated when they are small and then they are administered antibiotics and pesticides to keep them disease free. A study released by the Environmental Working Group on July 30, 2003, showed that there were high levels of PCBs (chemicals that raise the chance of cancer) in farm-raised salmon in U.S. grocery stores and were much higher than those levels found in wild-caught salmon. Additionally, some sources cite that farm-raised salmon are also contain 2 to 10 times the amount of mercury than wild-caught salmon (attributed to their feed). The pink color of a wild salmon is the result of them consuming pink krill. In the farms, the color is due to an artificial pigment called canthaxanthin. A fish farmer can select the exact shade of pink by the pharmaceutical company's trademarked SalmoFanTM which is very similar to selecting paint colors at the store. Without the canthaxanthin the salmon would be a shade of light grey. Currently there is some debate over the safety of canthaxanthin which has been attributed to retinal damage when people ingest it in the form of a sunless tanning tablet - while this use has been banned in some countries such as Britain, it is still used in the U.S. In Conclusion: Wild salmon typically have a higher nutritional value compared to farm-raised salmon and we therefore recommend Wild caught salmon whenever possible.